1) Royaume de Naples, Bruges – Parti au 1 d’azur à l’aigle d’or au 2 de gueules à une tour sommée d’une tourelle d’argent acc de sept fleurs-de-lis du même 1 en chef 2 accostant la tourelle 2 accostant la tour et 2 en pointe. English: Per pale: 1st azure with an eagle or; 2nd gules with a tower surmounted by a turret argent, accompanied by seven fleur de lys of the same – 1 in chief, 2 on either side of the turret, 2 on either side of the tower and 2 in base. 2) de Garidech – Gascogne, Toscane, Languedoc – D’or à trois chevrons de sable Sur le tout d’azur à trois fleurs-de-lis d’or. English: Or three chevrons sable, on an escutcheon azure three fleur de lys or. 3) Guascons de Garridech (de), Gascons (de), parfois Le Gascon ou Gascon ou Gacon – Gascogne?, Languedoc, Toulouse, puis après le XVIe siècle, Franche-Comté, Bourgogne- D’or à trois chevrons de sable à un écusson d’azur brochant sur le tout chargé de trois fleurs-de-lys d’or English:Or three chevrons sable, an escucheon azure covering overall, charged with three fleurs-de-lys or. 4) Gascoigne – (Lassingcroft, Parlington, and Gawthrope, Yorkshire, Norfolk and Kerby, Northamptonshire) (Borne by Sir Crispe Gascoyne, Lord Mayor of London, 1753, and Richard Gascoigne, of Breham Briggen, Yorkshire, Esq. 1600.) Argent on a pale sable a demi lucy, erect, couped, or. Crest: Out of a ducal coronet or, a demi lucy, erect, of the last. 5) Gascoigne – (Parlington, co. York). Quarterly, 1st and 4th, ar. on a pale sa. a demi lucy erect couped or, a canton gu., for Gascoigne; 2nd and 3rd, ar. a chev. sa. betw. two pellets in chief, and a fish in base gu., for Oliver. Crest—Out of a ducal coronet or, a demi lucy erect of the last, charged with a pellet. 6) Gascoigne – (quartered by Nevill, of Leversedge. Visit. 1612. Har. MS. 1437). (co. Durham). Ar. on a pale sa. a conger eel’s head couped or, in the dexter canton a cross crosslet fitchee of the second. 7) Gascoigne – Sa. three conger cels’ heads couped and erect or. 8) Gascoigne – de Barnbow – Ecosse – (Baronet, 1635. M. ét. le 11 fév. 1811) – D’argent au pal de sable ch d’un brochet sans tête d’or posé en pal Casque couronné Cimier le brochet issant. English: Argent a pale sable charged with a pike (fish) [without? – possibly a mis-transcription for “seul”, – only] head or placed palewise crowned with a helmet Crest: the pike issuant. 9) Gascoigne – Or, a chief azure. 11) Gascoine – (Fun. Ent. of the wife of John Miles, Sheriff of Dublin, whose maiden name was Gascoine). Ar. on a fess sa. a lucy naiant or. 12) Gascoyne – (Cardington, co. Bedford). (Sir William Gascoyse, knighted in Ireland by Robert, Earl of Essex, Lord Lieutenant, 30 July, 1599). Ar. on a pale sa. a demi lucy (or conger’s head) erect couped or. Crest—A demi lucy’s head erect or, betw. two ostrich feathers. 13) Gascoyne – or Gascoigne – (co. Norfolk, Kerby, co. Northampton, and Gawthorpe, Lassingeroft, and Parlington co. York). Same Arms. Crest—Out of a ducal coronet or, a demi lucy erect of the last. 14) Gascoyne – (co. York). Az. (another, sa.) three lucies’ head couped or. 15) Gascoing – Normandie – D’argent à une tiercefeuille de gueules acc de trois merlettes du même. English: Argent a trefoil gules accompanied (surrounded) by three merlettes (beakless and feetless ducks) of the same. 16) Gascoing – Nivernais – D’argent à trois raisins d’azur. English: Argent three grapes azure. 17) Guasconi – Alessandria – D’oro e alla tre caprioli d’azzurro. English: Gold with 3 cheverons blue. 18) Guasconi – Firenze & Sicilia – D’argento e a tre caprioli di nero e iI secondo sormontato da una crocetta potenziata dello stesso. English: Silver with 3 cheverons black and the second surmmonted by a potent crosslet of the same. 19) Guasconi – Firenze – 3 scaglioni di nero su argento – il secondo scaglione cimato da una crocetta patente di rosso su argento. English: Silver shield with 3 black cheverons, the second cheveron surmounted by crosslet potent of red. 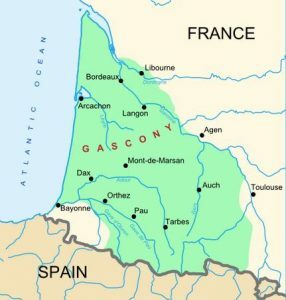 The surname Gascon is a variant of the surname Gascoigne and is a French, Spanish, and English locational name denoting a person who came from the province of Gascony (or Gascogne), France, which was on the nation’s southern border with Spain. 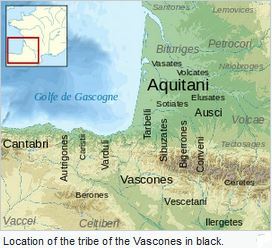 The name of this region derives from the Basques, who once extended into and lived nearby this territory, a group of people called Vascones by the Romans. By the Middle Ages, the Basques had been displaced from the area by people who spoke Gascon (a dialect of the Occitan language, related to Frenc), who were well known for their boastfulness. In the eleventh century AD, Gascony united with Aquataine and was thus ruled by England from 1554-1453 AD. One source asserts this family was an eminent aristocratic family who held lands and titles in the seigneurie of Garidech as well as in Languedoc. This same source claims the Gascon family was also first located in Hamburg, Germany. In his book, Patronymica Britannica, Mark Anthony Lower, writes the following on this surname: “The heads of the family were all Williams, the courageos Chief-Justice who sent Prince Henry to prison, being on”. The name was brought into England during the Norman Invasion of 1066 and became spelled Gascoigne. It took root in West Riding, county Yorkshire. Samuel Lewis’ book A Topographical Dictionary of England, states “The parish comprises by computation 4,030 acres, and is chiefly the property of the daughters and co-heiresses of R.O. Gascoigne, Esq.”. Common spelling variants or names with similar etymologies include Gascogne, Gascoigne, Gascoyne, Gascoine, Gascoing, Gascoin, Gascouin, Gaskoyne, Gasciogne, Gaskin, and several others, sometimes including the prefix la, meaning “of”. The Italian spelling is Guasconi. The last name Gascon ranks 15,135th in popularity in the United Status as of the 2000 Census. The name ranks particularly high in the following five states: Hawaii, Louisiana, California, Nevada, and Oregon. The spelling variant Gascoigne ranks 39,195th and the spelling variant Gascoyne ranks 77,038th. The surname Gascon frequency/commonness ranks as follows in the following nations: Spain (548th), Philippines (702nd), and Cuba (1,753). The earliest known bearer of this surname was Bernard Gascon who was documented in the Curia Regis Rolls of Northamptonshire in 1206 AD. The Hundred Rolls of 1273 AD, a census of Wales and England, known in Latin as Rotuli Hundredorum lists one bearer of this surname: Geoffrey Gascoyne in county Norfolk. A one Peter Gascoying was recorded in Devonshire, England in 1274 AD. William Gascoigne was a witness in the Fine Court Rolls of Huntingdonshire in 1389 AD. Thomas Gascoigne, D.D. of Oriel College, Oxford was chancellor of the university from 1434 to 1444. William de Gasconia was recorded in county Buckinghamshire during the reigns of Kings Henry III and Edward I who was documented in the Testa de Neville, sive Liber Feodorum. The Poll Tax of Yorkshire in 1379 AD lists one bearer of this last name: Johannes Gascoigne. An early baptism involving this name was Dorothye, daughter of George Gascoigne at St. James Clerkenwell in 1624. An early marriage involving this name was John Gascoyne to Sarah Johnson in London in 1696. 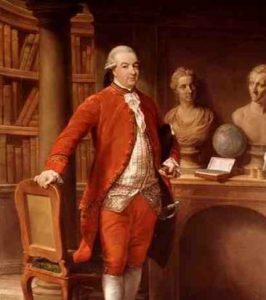 Philip le Gascoyne was documented in the Excerpta e Rotulis Finium in Turri Londinensi. Jacob Gascoigne was documented in the Calendarium Inquisition Post Mortem. Mary Isabella and Elizabeth Oliver-Gascoigne, of Parlington, in county York, and of Castle Oliver, county Limerick, succeeded the estates upon the demise of their father in 1843. The elder daughter, Mary Isabella married Frederic Charles Trench Esq. in 1840 who assumed the additional surname of Gascoigne as part of this marriage. He was a Justice of the Peace and Deputy Lieutenant for counties York and Limerick, and High Sheriff for the latter in 1863, and the former in 1864, as well Justice of the Peace for county Argyll. In 1851, his son and heir was born, named Frederick Richard Thomas, a Lieutenant of the Royal Horse Guards. The younger daughter, Elizabeth, married Frederick Mason, Lord Ashtown, in 1852. 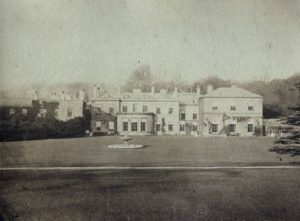 The Gascoigne family was one of great antiquity who acquired the estate of Gawthorp in early times, in marriage with the daughter and co-heir of John de Gawthorp. 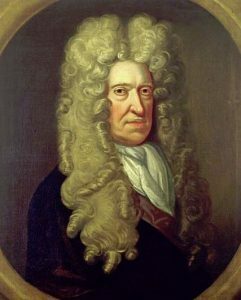 The senior line derives from Sir William Gascoigne, the Chief Justice during the reign of King Henry VI of England, terminated in heiress, Margaret, wife of Thomas Wentworth, Esquire of Wentworth, who was the grandfather of Thomas, 1st Earl of Strattford. The next branch of the family tree were the Gascoignes of Thorpe on the Hill, who sprung from the 2nd son of the Gawthorp family. The co-heiresses were Margery, wife of Henry Proctor, Esq. of New Hall, near Otlet; and Eleanor, wife of Arthur Ingram, Groom of the Privy Chamber to King Charles II. 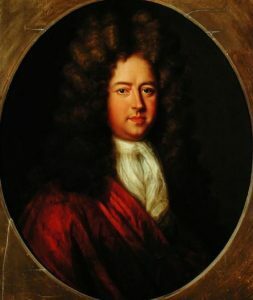 The Gascoignes of Parlington derived their descent from Nicholas Gascoigne, of Lasingcroft, younger brother of the Chief Justice, and were raised to the Baronetcy of Scotland by Charles I, in the the person of Sir John Gascoigne of Parlington. The last Baronet, Sir Thomas Gascoigne, married Mary, daughter of James Shuttleworth, Esq. 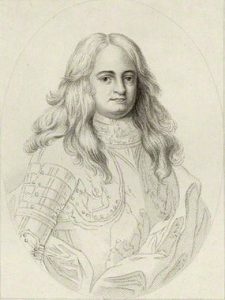 of Forcet, and widow of Sir Charles Turner, Baronet of Kirkleatham, county York, by whom he had an only child Thomas who died in 18-09. Sir Thomas died in 1810, and had no issue, hence his estates went to Mr. and Mrs. Oliver (his step-daughter_, for their lives, with the remainder to their sons, and then to their daughters. Under the settlement, Mr. Oliver, who was the eldest son of the Right Honorable Silver Oliver, of Castle Oliver, county Limerrick, assumed the name and arms of Gascoigne, becoming Richard Oliver-Gascoigne, Esquire of Parlington, as well as of Castle Oliver. 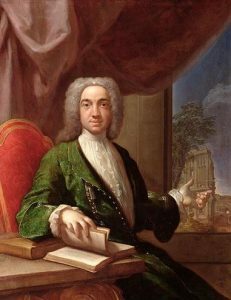 He married Miss Turner, daughter of Sir Charles Turnet of Kikleatham, and had four children with her: Thomas Oliver, Richard Silver, Mary Isabela Oliver, and Elizabeth Oliver. He was the High Sheriff of Yorkshire in 1831. The Gascoigne Coat of Arms (mistakenly called the Gascoigne Family Crest) is blazoned in heraldry as follows: Quarterly, 1st and 4th, argent, on a pale sable a demi-lucy erect couped or, a canton gules, for Gascoigne; 2nd and 3rd, argent, a chevron sable between two pellets in chief and a fish in base gules, for Oliver. Crest: Out of a ducal coronet or, a demi-lucy erect gold, charged with a pellet. The family was seated at Parlington Park, Aberford and at Craiguish Castle, Lochgilphead. Lord Adam was born in around 1000 AD. He had a son named Thorote Gascon who was born around 1018 AD. He married a woman with the last name Mahaut and had a daughter with her named Lucie Gascon or Wascon who was born in Warmenhuysen, Holland around 1036 AD. She married Hugues Sohier and had a son with her named Walter. Robert Gaskins was born in Northampton County, Virginia around 1650. He married Elizabeth Luke and had a son with her named Robert. This Robert Gascoyne Jr. was born in Virginia around 1673 AD. He married Anne Fisher and had a son with her named Harmon Gascoygne or Gaskin(s) who was born in Virginia around 1696. He married Rachel Benthall and had two issue with her: Fisher and Thomas. Margaret Gascoigne, born 1532, married Thomas Wentworth, had issue: Catherine, William, and Margaret. Savill Gascoyne, age 29, came to Virginia aboard the Merchant’s Hope in July 1635. Peter Gascoign was buried in the parish of St. Michael’s Barbados in July 1679. Stephen Gascoyne, Esquire, and his wife, had 8 servants in the town of St. Michael Barbados in 1680. The book Genealogical Guide to the Early Settlers, mentions one bearers of this last name: Edward Gascoyne, of Salem, who was a shipwright, had a land grant in 1637, married Sarah and had issue with her named Samuel (1639), Daniel (1640), Sarah (1643), Hannah (1646), and Edward (1648). Early settlers in colonial America bearing this surname include James Gascoigne (Georgia 1735) and Thomas Gascoyne (Maryland 1774). In Canada, Pierre Gascon settled in Quebec in 1699. In New Zealand, a one H.M. Gascoyne came in 1859 aboard the Golconda, arriving in Nelson. I researched the following three resources and did not find any coats of arms for Gascon, Gascoigne, Gascoyne or any of the other spelling variants: Bolton’s American Armory, Matthew’s American Armoury and Bluebook, and Crozier’s General Armory. The Gascoigne family motto is Tam Mari quam Mercurio, meaning “As much devoted to Mars as Mercury”. The Gascoyne family motto is Raison pour guide, meaning “Reason for guide”. We have 20 coats of arms for the Gascon/Gascoigne surname and its spelling variants depicted here. These 20 blazons are from four different heraldic sources. A) The British genealogist Bernard Burke’s book The General Armory of England, Ireland, and Scotland, which was published in 1848. C) The Dutch genealogist/heraldist John Baptista Rietstap’s book Armorial Général, published in 1884. D) G. B. Di Crollalanza’s book Dizionario Storico, blasonico delle famiglie nobilie notabili Italiane, published in 1886. The bottom of this page contains the blazons, and in many instances contains some historical, geographical, and genealogical about where coat of arms was found and who bore it. Some information is in both French and English. 1) Sir Alvary Douglas Frederick Trench-Gascoigne (1893-1970) was a British diplomatic who served as a Second Lieutenant in the cavalry dragoons in World War I. 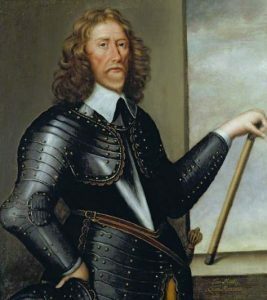 2) Sir Bernard Gascoigne (1614-1687) who was an Italian diplomat and adventurer who was a royalist office during the English Civil War. In Italian, his name was Bernardo Guasconi. 3) Biana Gascoigne (1986) is an British model and TV actress born in Hertfordshire, England. 5) Sidney Charles Bartholomew Gascoigne (1915-2010) was an New Zealand born Australian optical astronomer specializing in photometry who helped design the Anglo-Australian Telescope. 7) David Gascoyne (1916-2001) who was an English poet of the Surrealist movement born in Harrow, London. 8) Thomas Jepspn Gascoyne (1876-1917) who was an English professional cycling champion from Whitting, Chesterfield, Derbyshire. 9) Michael Gascoyne (1963) who is a British Formula One designer and engineer born in Norwich who worked for numerous Grand Prix teams (ex. Sauber, Tyrrell, and McLaren). 10) Major General Sir Julian Alvery Gascoigne (1903-1989) who served in World War II and became the Governor of Bermuda from 1959-1964. Three main heraldic symbols within the Gascon Coat of Arms or Gascoigne Coat of Arms (erroneously called the Gascon Family Crest or Gascoigne Family Crest) are the lucie/eel and fleur-de-lis. Fish in great variety abound in Heraldry, many different species inhabit coats of arms 801, although truth be told many of the actual images are sometimes indistinguishable, being shown as a stylised, and easily recognized “trout” shape that a child might draw. The actual name used in the coat of arms may be some play-on-words or allusion to the family name, as in the famous arms of the de Lucy family, being “Gules, three lucies or”, this being an ancient name for the fish we call today a “pike”. It is possible that the lucie has been used in this fashion, or it may simply relate to some fishing activity in the history of the family. The fleur-de-lys (“flower of the lily”) has a long and noble history and was a symbol associated with the royalty of France even before heraldry became widespread. The Lily flower is said to represent “Purity, or whiteness of soul” and sometimes associated with the Virgin Mary. The fleur-de-lys is also used as a small “badge”, known as a mark of cadency to show that the holder is the sixth son of the present holder of the arms. Sir, we will compose a brief article on the Gascon name in the coming days. My name is Laurel Gascon . Bertrand Lalonge is my 8th Great Grandfather on both my Mothers and Fathers side making me 87% French. I’m visiting France in June and hope to find my roots. Pierre Lalonge dit la Gascon Bernard is my 7th Great Grandfather and was among the French Settlers that came to Quebec in 1600’s. Any help is appreciate. I know the coat of arms is yellow fleur- de-lys on a blue background.